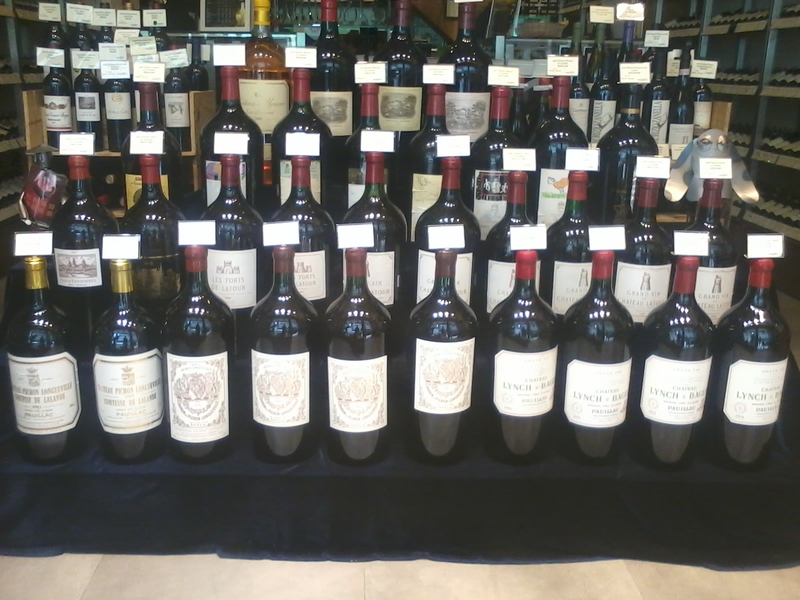 LeDomduVin: Hong Kong: Hub of wine buying, Yes! But is it really the hub of wine selling and drinking? Hong Kong: Hub of wine buying, Yes! But is it really the hub of wine selling and drinking? Over the last 2-3 years, Hong Kong has become the new world hub of luxury goods and more especially high-end wines. Auction houses like Acker Merrall and Condit followed by Christie's and Sotheby's (HK branches) are breaking world records of sales, now predominantely selling to richer middle class and corporate companies from mainland China rather than Hong Kong customers and consumers. Even foreign connoisseurs and collectors from Europe, USA, Russia and a few more countries, who continue to occasionally attend some of London and New York auctions, are now coming to Hong Kong. Yet, due to the economy, the amount of foreign buyers has tremendously depleted, compared to the ever increasing new wave of rich mainland Chinese and Hong kong buyers. Evidently, due to the rapid Chinese economic growth over the last 4 years, a touch of occidental influence as well as the amount of potential customers in China (due to the population density) and the young state of this juvenile market, Hong Kong has become the world's hub of wine buying and the Chinese gate to a booming wine market. Rich Hong Kong and mainland Chinese connoisseurs, amateurs, buyers and consumers are undeniably concerned and careful about the brands and the names, but also how and where they buy their wines. They usually buy mostly from expert specialized merchants, private owners and auction houses enabling them to verify quality and provenance, rather than buying in uncertain main street wine stores. However, my concern, which is also the reason behind this little article, is that most of these wines (once again) are bought for speculation, investment and lucrative activities and businesses, rather than consumption. Especially the old vintages of top growth Bordeaux and Burgundy wines, which instead of delighting the palates of convives gathered at a table sharing dinner and laughers, spend more time travelling in containers all around the world from a city and auction to the next, without even seeing the rim of a glass, to end up in a warehouse or a private cellar until the next sale. If you have any interest (or even worst, refuse to believe in that fact), take a few minutes of your precious time spend mostly on social network and chat zone to do a market analysis of some of these wines. The internet gives you all the tools you need to come up with a precise idea. Vinopedia, Wine Searcher, Liv-Ex, Vinfolio's Wine Prices, Wine Market Journal, Wine Decider, Snooth, CellarTracker, Idealwine, and a few more (among others) represent some of the most powerful and recognized search engines on the market. Wine Prices and Wine Market Journal, for example, even give you the date of previous auction sales, which could help you to realized that certain wines have gone around the planet more than once over the last 10-20 years(+) between London, Paris, Geneva, Berlin, New York, San Francisco, Rio, Tokyo, Singapore and Shanghai before landing in Hong Kong (and maybe go for another round...). Speculation on wine is not new and has always been very active at least for the last 30 years, yet it has never really reached such nonsense, craze and disputable pricing until 2000. The last decade saw the biggest inflation of price ever recorded in Bordeaux top growth, the En Primeur prices nearly multiplied by 10 in 10 years. A 1st growth En Primeur 2000 went in first tranche in the market for about $125-150 a bottle; while the same label 2009 vintage, went between $875-950 a bottle. Therefore, their again, the wines seem sold from a buyer to another buyer to make money rather than being sold, then consumed and appreciated as it should be. The ever rising prices also scare the mundane consumers. Expensive wines have become a casual commodities that even the rich and famous seem to really appreciate more for the return they could make out of them rather than the aromas, flavors, sensations and pleasure they could procure instead. Everything is about business nowadays, fast efficiency and results and money making deals, no time anymore to enjoy life and even less for a good bottle of wine. That said, one question come to mind: Hong Kong, Hub of wine buying, yes! But is it really also the hub of wine selling and drinking? In my opinion, not really, but before jumping too hastily to conclusion, let me try to explain my point of view, based on my years of experience as Sommelier and Wine buyer for retails and restaurants in various market such as Bordeaux, Paris, London, New York and now Hong Kong. In fact, let's talk about the few factors that will explain why sales are not booming in HK. First, wine consumption has never been a cultural thing in Hong Kong where people are more concerned by their health, their cloths and job title. HK culture is more incline to hot water, tea, beer, cocktail and hard alcohol rather than wine. Certain acohol and more especially wine in general can have secondary effects that surprisingly, compared to any other etnies and races, really affect a big part of the Asian population. But also because people are always working, doing longer hours than before to show that they are dedicated to their job, showing how important and dependable they are (understandable in such economy) to always obtain better results, and more of this and more of that, while not taking the time to really enjoy life, family, friends, food and wine. They usually end up stress and nervous, always on their smartphone, busier than ever due to the amount of texts, chats, emails and social network updates and comments they have to post minutely, yet it is part of their work...not their life they said... But this is another subject. The other things is surely due to lack of knowledge, education and interest on the subject. Altough, it is changing slowly, and despite the ever growing numbers of certified and uncertified wine courses and wine school around town, I can not help to notice how empty average main street wine stores are and how narrow their wine selection is. Probably one of the reasons why that they have a huge lack of pedstrians traffic, despite maybe a few tourists. Peering at the shelves of most Hong Kong wine retailers, it is not difficult to realize that some of the greatest Bordeaux and Burgundy wines are more predominantly represented than any other wine regions in the world, led by the First Growths and DRC of course. It is actually quite amazing to see the line up of all of these expensive bottles and larger formats, waiting patiently standing up, in full light behind the windows or on the shelves, while nobody in Hong Kong really buys their wines in these mostly-empty-of-customers main street wine retail stores. Understandably, they usually source their wines elsewhere, surely because standing up bottles are an acceptable common concept for small retailers and supermarket chains offering an interesting wine selection with more attractive and competitive prices generating cash flow and quick turnover (i.e. Mark & Spencer, etc...). Therefore, it is folly, for these small main street wine stores, to expect a quick turnover and successful business returns, when mainly offering expensive bottles of Bordeaux and Burgundies, lots in large format too, especially if they have been standing up in the light for weeks or even months, with the cork drying and the wine turning, without seeing a soul. HK small community of real connoisseurs and amateurs are looking at the conditions in which the bottles rest, hence it is not surprising these kind of stores don't inspire much sell (add the hefty prices and the counterfeits, and now you have a clearer picture of why these stores are often empty). The selection has also something to do with it. In fact, most Hong Kong wine retailers don't offer much of any else aside of Bordeaux and Burgundies, despite a few usual suspects and high end wines from Australia, New Zealand and Italy and a rare few from the US. Rarely or scarcely represented are the beautiful and less expensive gems from Spain, Portugal, Germany, Austria, Argentina, Chile and South Africa just to name some of the most recognized world wine countries, and strangely enough barely no Chinese wines either (but this is more a question of locale culture..., it is not my place to talk about this on this blog, so just ask someone from Hong Kong, they usually are pretty explicit when describing people from mainland China). However, let's get back to wine. In fact, being the world references of wine, fetching astronomical prices (and god knows the Hong Kong people love the luxury brands), Bordeaux and Burgundy have been crowding the shelves of most Hong Kong retail stores and the wine lists of most HK restaurants for years, especially those with more occidental influenced food. Unfortunately, these beautiful Burgundian and Bordeaux gems are not really selling, rather taking the dust more than anything else, due to some of the multiple reasons and factors cited above, including hefty prices, crumbling economy, bad storage conditions and, even triggering more concerns lately, fake bottles. I know, I'm repeating myself, but I would like to stress the point that lack of interest due to the economy and genuine fear from the customers about the wine quality, are especially true for the wine retail stores where shelves seem overcrowded with countless amount of unsold bottles, magnums and even larger size bottles of some of the most expensive French wines standing up in full light and poor air conditioning system. Moreover, the ever increasing number of counterfeit bottles discovered over the last few years had huge consequences on the market, consequently sales have been declining deeply over the past year-or-so. The recent growth of the Chinese economy is also slightly slowing down. The last quarter of 2011 was the worst with sales in retails and restaurants depleting dramatically (despite a little surge around Christmas and New Year celebration, yet usually representing a higher percentage of the year sales). Also, the last two quarter of 2012 didn't bring back the spike of hope eagerly awaited by most importers, suppliers and distributors. All the above combined with a slowing down economy, the prices going up and the customers being rather cautious with an easy-on-the-wallet attitude, put the Hong Kong wine buying mood on a down slope. It has been happening everywhere else, more especially in Europe and the US; and even if until now HK has managed to remain slightly above the water as the door to an emerging and rapidly growing market in China with enormous potential, the wine buying market has far exceeded the wine selling market. Although China and more especially Hong Kong remain full of Ferrari, Lamborghini, Porsche, Rolls Royce, Bentley as well as privately owned yachts and jets, wine warehouses and stores alike are full of unsold stocks of expensive and exciting wines, but interested customers are not as numerous as expected and attitudes have changed regarding buying and consuming high end bottles. Also, although wine has been produced in this part of the world for centuries and the Brits brought a bit of their knowledge and wine drinking culture, the Hong Kong and to a certain extend the Chinese wine market consumption is a fairly new market (15-20 years maximum) compared to the rest of the western world, where drinking and consuming wines have always been fully integrated parts of centuries-old culture and traditions. Therefore, the Chinese and Hong Kong wine connoisseurs and amateurs constitute only a small minority of the population, which also explain the sales not being as good as expected. Most importers, suppliers and distributors, probably thought that it will be an easy thing for them to sell their stocks, even the bad vintages (young uneducated market tend to fall easily for this kind of thing at the beginning. However, my personal experience working in two Hong Kong restaurants and quite a few wine events in various places, enable me to say that not many people drink wines in restaurant. Most of the time, it was the foreigners, expats and tourists, who will order a glass of wine for the lunch or a bottle for dinner, rarely the Chinese customers. In fact, the latter were ordering more hot water, tea, fruit juice and beers than wine. But there again, things are slightly changing and more wine is getting consumed, yet we are far from Europe and the Americas in general in terms of wine consumption. In any case, let's not forget that China wine production place them in the top 5 largest producers in the world. That position does not yet reflect the Chinese wine consumption yet, but, a surge of wine education and wine consumption in the last few years put the Chinese within the the top 10 wine consumer in the world. Things are also changing in Hong Kong too. In fact, and more especially since 2008 when Hong Kong decided to take off the tax on wine, everybody realized the birth of a very lucrative business, importing and distributing wines. Suddenly, corporate companies as well as small investors all in the same time had the same idea, and the word spread very quickly. In less than 2 years, more than 1000 importers and distributors were fighting for their respective piece of the Hong Kong wine market. By september 2011, more than 3000 importers, suppliers and distributors were overcrowding and overflowing the market with wines. A year later, probably only 10-15% are really making a good living, the rest of them are struggling to sell their stocks. Moreover, small innovative retailers are now even importing directly their wines for their boutiques, finding a niche and new ways to attract customers and being different. The last two years have pushed most of them to turn their head and business towards mainland China, but then again, things are not are easy as they seemed they will be at the beginning. As for the available wine selection, even thought it is slightly changing, it remains mainly French based. The rest of the world wines are more wildly found now, while barely nonexistent still 2-3 years ago. Wines from Spain, USA, Germany, Austria, Chile, Argentina and even South Africa, and not only the big appellations or big brands, are currently more represented in more specialized stores, which help diversify the shelves and wine-list around the proud Asia's World City. Being also better value for money, they make for a better and more adequate choice for most consumers. Consequently, and in my opinion, it seems that the Hong Kong market is the hub of wine buyers and wine buiying for sure; yet the buying market doesn't reflect the selling marketing which is still struggling, suffering from being overcrowded and over-flooded with an insane amount of unsold and snail-moving-speed wine stocks. The recent exodus of expats to Hong Kong, especially from France and Europe in general, in addition to the locals who, over the last few years, opened countless wine import-export and distribution companies as well as small retail stores, submerged the market with thousands of wines from all over. They were first thinking that selling wines in HK was lucrative and profitable enough to make a better living, yet they didn't realized how fierce the competition will be. The most successful businesses were established about 4-5 years ago when the movement started after the abolition of import duties and other taxation on wine, but it has faded tremendously since then and the market is now somewhat out of breath with new comers facing a very difficult market in Hong Kong. While mainland China market is still booming and growing, some of the most fortunate and wealthy mainland Chinese continue to come and shop in some of Hong Kong well established and reputed wine Auction houses and specialized retailers and private cellars. Yet, the selling numbers and statistics, compared to the continuous flux of wine palettes constantly arriving in Hong Kong, are way under what they should be, even if a good part of it is sold to mainland China. Therefore and in conclusion, and after all of the above factors and reasons, (I could still talk about it but it would be too long), I can confidentally say that Yes, Hong Kong is surely the new hub of wine buying, like New York was 6-7 years ago and London still has been over the last 15 years, but no it is not the hub of wine selling and even less the hub of wine drinking. There is still a long way to go to reach that point. To be continued... as this blog is my hub to the endless wine debates and discussions that daily crowd my head.